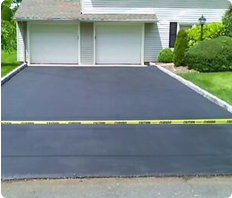 Seal coating an asphalt driveway every few year's will not only make it look better, but it will also make it stronger. Sealing, protects the pavement from the sun's ultraviolet rays, which can deteriorate and harm the asphalt altogether. Seal coating also stops water and ice from getting into the road surface and causing it to collapse. We can help you in the process of protecting and beautifying your driveway.